The Sooriyawewa International Cricket Stadium in Hambantota is well set to become Sri Lanka’s eighth Test venue when the West Indies tour the island later this year. 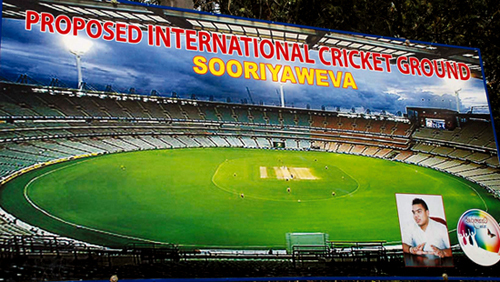 This will be Sri Lanka’s third floodlit international cricket stadium which is been constructed to coincide with the 2011 International Cricket Council (ICC) World Cup. The Stadium will host two World Cup matches on February 20, 2011 between Sri Lanka and Canada followed by the second game between Kenya and Pakistan on February 23. 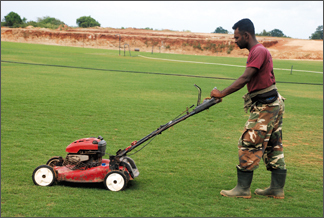 This cricket stadium situated in the remote area of Meegahajandura off Sooriyawewa, approximately eight kilo metres from the emerging commercial hub of Hambantota, is the brainchild of Namal Rajapaksa Chairman Tharunyata Hetak Youth Movement. This is considered as one of the major projects in the Hambantota area where a several other developments are also initiated by the present government of Sri Lanka and the first phase of construction began on May 17. Among the other development projects, the proposed international Airport is situated just 11 kilometres away from the international cricket stadium. Incidentally this is the second international cricket stadium in the dry zone apart from Dambulla. However unlike Dambulla there are many things to offer in and around the Hambantota area. The other significance is that it is just 70 kilometres to reach Nuwara Eliya from Sooriyawewa. Meanwhile plans are underway to include a hotel school, an international standard library, a vocational training centre and a fully fledged information technology centre around the area where the stadium is to come up. This stadium will also be a great opportunity for 18 cricket playing schools in the area where the cricketers have not had the privilege to play on turf wickets. This ground will be very helpful for the young cricketers in the area. The present location for the proposed stadium is situated on a 47-acre land. The location will be accessible from three major towns in the area covering the Uva, Sabaragamuwa and the Southern Province. This stadium is part of the future developments in the Hambantota area and its suburbs and the construction of the stadium began soon after the project obtained the Environmental Impact Assessment (EIA) report. The first phase of the stadium will include the dressing rooms for the teams and umpire rooms are set to complete. The Sri Lanka Army worked until the first phase was completed and from then the China Harbour Engineering Company took over to add the spectator stands. The stadium is expected to fulfill the ICC requirement of holding at least 30,000 spectators. The stadium will hold three mega scoreboards which will be elevated above the spectator stands. The main scoreboard is proposed to be manually controlled while the other two are state-of-the-art digital scoreboards. The main idea of having all scoreboards above the stands is to accommodate the maximum number of spectators. The grandstand alone will hold 8,000 spectators while a further 4,000 seats are to be completed with the first phase. Totally 20,000 permanent seats will be fixed while the standing pavilions will have the capacity to hold 15,000 spectators. The floodlights are the main feature of the stadium and once totally completed it is expected to resemble a pearl shaped object. In addition the stadium will have an ample supply of water with three main resources around the site. The closely situated Meegahajandura Lake, three high capacity tube wells and an agricultural well will provide the stadium’s water requirements. In addition a separate line by the Water Board of Sri Lanka will be provided for consumption purposes. A car park with the capacity of holding over 300 vehicles at a time will be set up next to the stadium. The entire project is set to be completed by October 2010. Arrangements are also underway to start building at least two star class hotels in the area before the commencement of the 2011 ICC World Cup. In addition Star Cruise ships have confirmed that they would dock one of their luxury ships during the World Cup 2011 in Hambantota harbour. Most of the tourist hotels around the area will be upgraded to 4 or 5 star in the near future. The floodlights will be a main feature apart from a few other latest additions at this stadium. The ICC requirements will meet with state-of-the-art umpire’s rooms, match referees rooms and an anti doping testing room which will be the latest in the world. Further the stadium will be featured as an eco-friendly venue which is considered to be one of the first with such concepts.